The Toyark › Toyark Spotlight › Discussion Of The Week Recap – Can Large Play Sets Sell? Discussion Of The Week Recap – Can Large Play Sets Sell? In a nutshell, if the Star Wars team at Hasbro isn’t confident enough in the idea of “pure playsets” to produce a definitive “Death Star” playset (which they have long since stated would be their first choice if they were in the playset-making business), I think it’s a pretty good sign that large playsets simply aren’t what they used to be, sales wise and possibly never will be again. “I don’t believe so. Back in the 80’s, the high end playsets were beyond the reach of most kids so shelfwarmed to clearance and these days, I think they’d sell even worse. You can check out some more great responses and post your own opinions by clicking the Discuss button. Thanks again to all those who participated. A new discussion will be up very shortly. Discussion Of The Week - Can Large Play Sets Still Sell? I personally have always loved large playsets. I was a child of the 80's and I had a plethora of great playsets for almost every action figure line that came out. They really helped make playtime a lot more fun. I have always been, and will always be, a huge fan of large playsets. That being said, I really don't think that large scale playsets will be around that much longer. First, they usually cost too much. I'm not sure if the cost of materials is the driving force behind this but modern playsets are usually ridiculously over-priced. Second, playsets definitely don't sell like they used to. Over the past few years I've seem some pretty good playsets that just didn't sell. Narnia's Prince Caspian Castle is a good example of this. TRU had them on clearance around my way for $25 and they still sat on the shelf. Indiana Jones' Temple playset and the G.I. Joe PITT are a few more examples. They may not be the best playsets ever made, but they are decent. And they are all good scene-setters for 3.75" figures. Still, they collect dust. Third, big playsets take up a lot of room. It can be hard to find a place for them at home. I've personally passed on buying a playset recently for this very reason. I already have too many and can't make room for any more without sacrificing what I already have. I think its unfortunate that playsets are not the crowning jewel of a toy line like they were 20 years ago. I love them, but I don't think they sell anymore. I think it's pretty telling that even the largest and most successful action figure line (Star Wars) isn't confident enough in "large playsets" to produce them on their own merits, but instead has to market them as "large vehicles" (Turbo Tank, AT-TE, and the recent Millennium Falcon, all of which blur the lines between vehicle and playset). Even the G.I. Joe Pit has a "vehicle mode." In a nutshell, if the Star Wars team at Hasbro isn't confident enough in the idea of "pure playsets" to produce a definitive "Death Star" playset (which they have long since stated would be their first choice if they were in the playset-making business), I think it's a pretty good sign that large playsets simply aren't what they used to be, sales wise and possibly never will be again. Even the playsets they produce for "movie years" tend to be lackluster, or end up getting recycled between lines. Cost ineffective for the toy makers unfortunately. They could reissue large playsets as an exclusive but the price would be to high. If they put them in stores then the problem is over produce and then not selling them. The days of the USS Flagg, Thundercat Cats Lair, USS Defiant, and Castle of Lions is gone. I don't believe so. Back in the 80's, the high end playsets were beyond the reach of most kids so shelfwarmed to clearance and these days, I think they'd sell even worse. With the rising cost of plastics, an intricate playset like Fortress Maximus would retail for several hundred dollars, just look at the price of the Car Robots Brave Maximus, and at that price they compete with games consoles. Lets face it, toys can't compete with videogames and there is also the size issue to contend with. What are parents going to choose, a small box that sits in front of the TV, or a giant hunk of plastic that will dominate the livingroom forever more? and in this economy no ones willing to buy something like that for there kids, plus at this point what would you do with them after the initial wow factor fades away they just go into the garage or attic to collect dust their...now I'm a collector but at this point Im very selective of what I buy gotta take into consideration money, and space to display. I really think the era of the super sized playsets is pretty much over yes we got the gi joe and some new limited production star wars ships but their not gonna be ought in mass like back in the day, the price is too high for allot of people and in many cases you an get the same vehicles in smaller scales for a fraction of the cost. even figures are being scaled down to maximize purchases like the marvel universe, dc universe figures and even the iron man 2 figures have a 3.5 scale figure line...I think eventually many reduced size playsets will fallow this trend in place of the large scale sets. When I wander down the Preschool/Baby toy Aisle, I see some very large & intricate items (see the playstations and bouncers, or plastic play kitchens and such). These things, I am estimating, contain the same amount of Plastic as the U.S.S. Flagg. Yet for the most part, they cost less than $100. I sometimes wonder if the toy lines with adult collectors are subsidising the baby and toddler toys, but I digress. I don't think that any 8-12 Y.O. Kid would Balk if they received for Christmas, the B.A. Millenium Falcon, or Defiant Shuttle Complex, even if they had only a passing interest in the line. Obviously Big Items still sell, since the retailers are still ordering them. Nowadays, I think what ever the big item is it has to include the necessary WOW factor to get it off the retailer's shelf, the equaly necessary play features to keep it from being returned to the retailer's shelf (& excite the child's friends so that they will want one too), & include some utility either through organization or stowability. I think modular playsets are the way to go, buy them small, combine them to make bigger pieces. Cheaper production costs that way. Plus who doesn't like mini bases? Combine them to form a huge base and you have reason for kids to buy them. It would be great with Hasbro's 3 3/4th inch stuff, because it could span over all lines not just GI Joe, MU, etc. I personally have always loved them when done well. GI Joe, transformers, and superheroes specificly. Sure it's great when you're a kid to make pillow forts and caves for bases, but when I got the tmnt sewer playset as a kid, that immediately became my go to all for spiderman and more. Even a hand crafted dollhouse we had in the family became the X-Mansion. Castle Grayskull also fit into so much, as did even Fortress Maximus. So big playsets are always win. My only gripe as a kid to now is that they need to be more line specific and less cheesey like some were back in the day. But short of that, I don't see why they couldn't be a hit still when done right. Especially in the rise of Joe figures and MU figures. The drawback is having to balance that cross play factor, while still keeping it line specific. But a good playset always enhances play value and the imagination let alone displays. Some of my fondest toy memories as a kid are having spidey swing from a telephone pole, or even heroes fighting in the marvel superheroes training center. I think kids are more interested in toys that are used in some kind of game (like those battling marbles) or electronic ones (this includes toys that are part of an online game) to worry about playsets. Maybe I'm just too cynical. I know I'm to young to feel the awesomeness of the 80's but I have a lot of the playsets from the 80's and 90's(while not as much still some fun ones) and if the rest my generation and the ones younger than me are like me they will have as much fun as I do. no, they can't sell. the problem is that the majority of consumers won't spend the money. this is a toy website which is dominated by grown ups with jobs who view toys as a hobby... and even we aren't willing to spend the $100+ dollars on a millenium falcon. the only way they would work is if they were cheaper and that's not going to happen. in the past ten years g.i. joe went up in cost over 300%. this well outstripped inflation and oil costs. most companies are trying to be premium end toy makers, and any time their product doesn't sell they raise the price to cover what was lost on the last batch. i really think the toy market is in danger since so many die hards simply can't keep up. p.s. i owned the thundercats castle when i was a kid... it was awesome. i also had the joe's defiant w/crawler. the defiant cost one hundred dollars... that would mean it should cost $300 dollars if it came out now. who would pay that for a plastic shuttle? i'm not even willing to pay the $9 k-mart is asking for single g.i.joes. I am a fan of the playsets, but I know they are priced too high to be successful for a toyline. I love the Narnia Castle, but I know I didn't buy it until it was at least half MSRP. I remember as a kid busting out my Castle Greyskull and Skull Mountain playsets in the living room floor and loving it. Do kids still do that? I think smaller playsets that join together could be a possibility, or even an opportunity for a smaller company that is smart enough to take advantage of the need, but I think for the most part, playsets are a dying breed. Playsets would be a disaster for flash-in-the-pan movie licences like Star Trek, Terminator Salvation, Dragonball Evolutions and Rise of the Cobra. The figures themselves are barely selling. I still think they could be viable for established properties like Star Wars and TMNT though as long as they didn't go overboard. toy companys like Hasbro don't relise that playsets are a important part to toy sets like G.I.JOE, Star wars and other sets, and have said no more, but I beleive we must continue to convince them that we want them to create a battle feild. One I would like to see is a number of Death Star playsets that connect into one set, and maybe the naboo playsets from the 1999 to make a return, and more droid factory and bases. Just look at the Power Team Elite playsets. Those sell out all the time! They even invested in creating an all new playset. It's not that playsets don't sell. It's that Hasbro made some pretty crappy ones lately. Oh and the G.I. Joe PIT is not a playset it is a vehicle so it doesn't count. The Big Millenium Falcon would be the closest thing to a playset. That's the thing that bugged me in the 90s with playsets. Neon girders, and other wild colors, even toybiz did a mostly purple dangerroom/cerebro carrying case. Awesome idea but the colors being so flashy really knocked down the fun aspect and broke the imagination realism. Playsets don't have to be massive interactive and expensive, just accurate to the characters needs, and situations. Take the amazing friends apartment for example. If done in 3 parts it could be reasonably priced, fully accurate, and should in theory fly off the shelves with the media push from the toon reairing. It'd be a perfect water tester for these things. As would a tony stark armory. An additional factor that could help them sell, could even be amazing friends or other classic toons on a dvd that featured said hot zone. The problem is in going overboard with electronics that reallly raise cost on some items. But something simplistic, and accurate with multi-potential could really help. Like the amazing friends apartment in my example. Now not only have you spread the cost out among three items that interconnect, but you've also opened the door for teleport mishaps, like in Jumper, or other powers media that may get kids attentions. Being just a simple apartment, it can go from the amazing friends, to Stark's Dorm suite, to more. Sure figures come first, that's a given. But the right playsets can push civillian figures much easier as well. It's all in how you balance them as opposed to going straight for the massiveness at first. If cost can remain reasonable, with the right characters especially, these things would be flying off the shelves outright. The biggest issue is that reasonable cost though. And I will admit, outside of the toybiz X-Men TAS dangerroom/cerebro, and the tmnt technodrome and sewer playset, most of my stuff came from flea markets where prices were far cheaper. But if prices can get knocked down to the basic vehicle cost of 30 bucks, even packaged with sought after figures like female figures, or other rarities it could push them over the edge from obscure to highly sought after. Tony Stark with his armory, Pepper Potts with tony's office that connects to armory, Amazing friends civillian IDs each with a chunk of the apartment, even the shield helicarrier would all outright do well, and be sought after by collectors and kids alike. Especially if kept to moderately accurate aesthetics of the toons or comics themselves, instead of neon colors. The same could be said potentially to an X-23 facility playset that included her in X-force garb, agent morales, kimikura, and two facility guards. Three female figures and a playset, and if made, I doubt you'll ever find it on the shelves. Even if simplisticly made and at a 50-70 USD price tag. Often times, cost is the determining factor for things like this. However, many of you have hit upon the design and marketability to the consumer for it as well. I think, mainly, it's a "best bang for the buck" type of mentality. One trend I notice specifically with Hasbro is that they'll often include a figure with the playset. I really think this is a great move, as a playset may have to function as a standalone piece without any of the rest of the toyline. Why? Well, sometimes a consumer only has enough money for that single playset. One may be deterred if the playset isn't fully self-contained. It's only for that reason that I'm not a huge fan of the smaller playsets combining into a full playset. Sure, a company may want a "collect them all" mentality, but if someone can only find a certain number, their whole brand loyalty may come into question because of frustration, etc. Playsets are really risky business, but when done well they're simply EPIC. That's an extremely good point, which is why that one, it has to as few as possible for a full mini structure, 3 at max if it can be avoided. Or in like the x-men's case a lot of repeated architecture with few differences barring doors and stairs or underground tunnels. That becomes an issue, so you have to think around some of the larger ideas. Some of the other issues are access too, how does a play set remain usable to play with the figure where ever. So while say an accuratte helicarrier would rock, where exactly is the cut off point to access the interior? And then there's the characters you want to skip for various reasons losing their part. The BAF mentality is an issue. But one solved by a new trading aspect only with marvel world pieces. Especially, if for like the academy X kids it was just hallway doors to their rooms. If you don't want that character, why would you want that part for your mansion? Major architecture points repeated randomly through out the entire X-teams run. Then they pile up like accessories you can also trade or sell on your own, but so bland they remain only fine with figures. But this would call for a universal joining squares that cover all sides to build connectable cubes. Even allows for panel reuse elsewhere for whatever reason. Think like how a dublo fence works. It wouldn't be much, but really with a playset do you need much as a kid? Heck styrofoam even came in handy back then. This could also appeal to collectors because we can fit the pieces to whatever displays we like, from exterior fire escapes, and starks armory all able to fit on a shelf. Thise way you control what or where, and the plates are really just there as background stuff. They could then use it for whatever other toys work as well, from gi joe, to DCIH, or terminator. Not sure how well this would work with other lines. But if all the junction points were completely universal on this scale wih hasbro cross all lines, it'd be like legos all over again. Only with battlefields and apartments, or main dorm room stair areas. and mansion entrance, and just street panels and whatever else can be as mass used as say the MU bodies themselves are. This mass use, and incorporative featuers makes it easier for all to be used in any manner, and with them repeated at various wave points, per team figures, it'd make it easier on the BAF mentality by always being available later with something else. The cost might rise to a good 13 or so bucks, but it'd beat stuff like the deadpool giant cannon, and even let old ones be adaptable like the weapon X chamber. 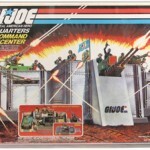 Think of what plastic could have been used in gi joe to make that could help. Especially those that troop build. That helps alleviate the playset issue some, but maybe not enough. But does marvel have the fanbase that would accept that? How far can they stray on the big ones without compromising all sales? Especially with something like the helicarrier. Then there's also stability with the various ways it could open. etc. The millenium falcon bears a similiar problem and it's only one floor, with a hidden cargo hatch inside. Honestly a BTR rebirth is the best move I can think of for this. And it'd be brilliant overall. Especially since they could incorporate characters into it too, by modifying some of the molds with BTR arm and leg points like the Joe line had. The problem with this, is it may alienate some younger buyers though as well, but with the small weapons already used in MU, should only be marginal. This method may only work with a character or two per corner set though. And even ships it'd have to be moderately slow and varied or expensive. Even if the helicarrier or armory could open up on hinges and be stable, that's a lot of plastic, and heavy/fragile. So limits it some as well. But it also boasts an amazing play factor of real debris during hulk/sentinel, thor gone made, ultron attack whatever debris too. Something like stary armory alcoves that fit together could work though for Ironman 2's line. This way all stark armor has an alcove that can stack and connect to each other for one massive hall of armor. This way again if you skip a figure, it's no real loss either. and a special box set of tony stark with homer/jarvis with a main PC. Giant vehicle or place exteriors are an issue it seams overall barring simplicity. To this end I guess the best compromise is Marvel Transformers/Starwars transformers. Vehicles to scale in a real world are a plus always, but some things of great size that can't be foreseeably done to scale for awhile barring cut out section battle scenes, should probably go here for now in full accurate glory and scale. The Supreme Deathstar, Unicron, Primus, so why not a shield helicarrier one? On the other flipside though, most of this talk is real world location stuff. Every city has sewers, backyards, hallways, buildings, cathedral windows etc. So this works for a myriad of lines. But what about stuff like transformers with iacon? Or other things like the inhumans city? Or atlantis, or even mount cheyenne or stargate room? The 'ark' playset coming up from the fan companies has me curious to this degree on what it'll cost with the low run. Something like that could work and even just be like buying lego base plate packs. Throw in a figure for added bonus if needed. But try to keep space consumption minimal. Long winded but condensed easier for a final point about this. We have two schools of thought here that become an issue to balance. The child who can use any and all materials handy to play with, and the collector who wants accuracy for a shelf, or display. The kid wants easy to reach areas, while still expansive, something that's not hard to have characters move around in or fight in, or even interact with while fighting. Some gimmicks to this end can come in handy. The collector doesn't want gimmicks, wants accuracy, and tends to frown on excess gaps. How do you balance this to please the collector, while still giving the kid the fun factors they would want to buy and beg mommy for. Kids are creative from styrofoam to pillows, and even boxes, so it's amazing what they can come up with for their worlds even with open spaces, and it costs them nothing but what they have generally anyway. So how do you combine that into something collectors will also want, and then keep the price reasonable. That seems to be the main complication here. Price alongside the dividing line of collectors to kid desires. How do you please both and keep it cheap? etc. Kids can combine for their own couch/chair/table war. While collectors get what they want to a degree as well. I can't think of anything else that really works for large playsets. To be quite frank for an expensive one to succeed it has to be something that can stay on the market for awhile. And yeah be useable for all kinds of play. I do think the millenium falcon could be done, but then that begs the question of what other ships deserve this? And how long before it's not feasible with the profit margins on production vs amount sold. 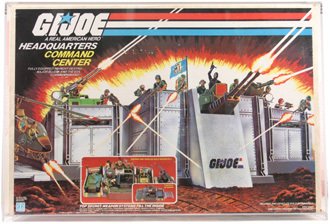 I do love what hasbro's done recently in GI Joe though with the backdrops, that does kind of allow all kinds of various ideas or slide in addons in the box to extend it or what not in just cardboard too. So Maybe that might be the best route, especially with allowing figures with it and play value. May not be a playset per se in name, but it's a good step forward at least. Sorry if I ran on and on, but these are all the aspects I can think of on it. Lots of things I'd like to see, but the feesibility and the how are grave issues. Especially when you have to balance figure interactivity to play value and display and keep cost within reason. Hasbro's been asked about the "build a playset" idea over and over and over and over again, and they've very consistently said "no, no, no, and no." Given the massive failure of Playmates' Star Trek attempt to utilize that very concept, I don't see Hasbro changing their mind anytime soon. It's a very risky market these days and given the status of the economy, I think most toy companies would rather back proven concepts for the short-term and occasionally test the waters. Take it from a father: babies are expensive all by themselves. If toys for them were as expensive as action figures, then very few parents would buy them. Having said that, the price difference is most likely due to the exta R&D and licensing that goes into the action figures. Face it, it doesn't take a rocket scientist to come up with a plastic stove these days. I think the problem with the Star Trek set was the same problem all BAF-style toys have: if you can't complete the set (or figure), what you have feels incomplete and less appealing (or outright useless, depending on what you have). Full Thread: Can Large Play Sets Still Sell?